Massey Tower is one of the hottest condominium projects in downtown Toronto with the integration of the historic 1905 Canadian Bank of Commerce coupled with its stellar location. The restored bank will be transformed into a luxurious grand lobby with turn of the century finishes and crystal opulence. Massey Tower is located directly across from the Eaton Centre, close to Ryerson University and numerous shops & restaurants. Subway and TTC is at your doorstep. Massey Tower features junior one bedrooms just under 400 square feet up to expansive three bedrooms of 1085 square feet. All suites were designed by award winning team Ceconni Simone. Square footages range from 377 per square foot to 1085 square feet. Mod Developments is the mastermind behind this spectacular development. Founded by Gary Switzer, former VP at Great Gulf Homes, who partnered up with renowned lawyer Noorez Lalani, Massey Tower has won numerous BILD Awards including Project of the Year Award. 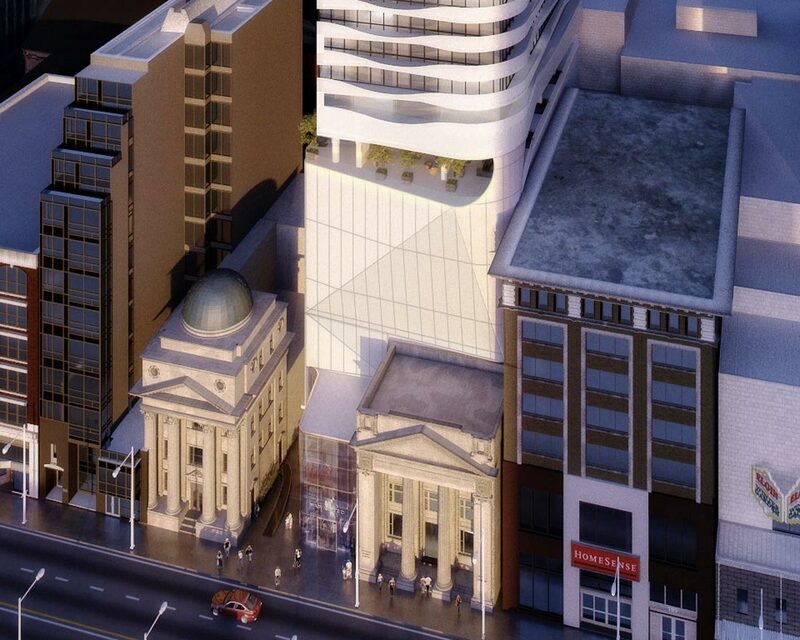 Massey Tower will be located in the historic 1905 Canadian Bank of Commerce. Harriri Pontariri was the award winning architect who had the vision to create this dramatic 60 storey tower with unique cantilevered balconies. Massey Towers location has it all. Directly across from the Eaton Centre, it is also just steps to Queen Street Subway , the Financial District to the South and the St. Lawrence Market to the East. State-of-the-art automobile elevators will access the automated parking . Parking available for 69,000 for suites that are 800 square feet and larger will be situated on the first six floors of the building. World Class Amenities feature a state of the art fitness club which includes cardio, weights, kinesis, yoga studio, sauna and steam rooms. Other amenities include a relaxation lounge and dining room fully equipped with a kitchen, martini bar, piano lounge and dance floor. Award winning landscape architect Janet Rosenberg and Associates will be designing a rooftop terrace which will have spectacular city views.